*First time visit. Call Angel Pet Hospital in Edmonds, WA for details and appointment. Open 24 hours, 7 days a week. Not valid with any other offer. With Valpak® coupon only. Coupon void if altered. Expires 05/02/2019. Basic vaccination. Dogs or cats. Quality veterinary services at low costs. $17 pet vaccinations coupon valid at Angel Pet Hospital in Edmonds, WA. Not valid with any other offer. With Valpak® coupon only. Coupon void if altered. Expires 05/02/2019. *In heat or pregnancy additional fee. Current vaccinations required. Spay/Neuter coupon valid at Angel Pet Hospital in Edmonds, WA. Not valid with any other offer. With Valpak® coupon only. Coupon void if altered. Expires 05/02/2019. Angel Pet Hospital understands how important your pet is, and we have been offering exceptional veterinary services at affordable prices for over 10 years. At Angel Pet Hospital we are committed to providing you and your pets with the best possible service and veterinary medical care. Our well-respected team is compassionate and knowledgeable. We offer state of the art care and treatment for all manner of ailments that may afflict our furry four-legged friends. We offer a full range of pet care services including dentistry, surgery and more. Conveniently open 7 days a week. Dental Care, Emergency Care, Microchip Identification Implementation, Pain Management, Spaying & Neutering, Surgery & Intensive Care, Vaccinations & Seasonal Shots, General Care & Exams, Hospital Services, Low Cost, Digital X-Rays, Cardiology, Same-Day Appointments, Affordable Prices, X-Rays, Skin Diagnostics, Parasite Control, EKG. Angel Pet Hospital offers savings and printable coupons for animal services such as: Pet dental care, soft tissue and any bone surgery for your pet, spay/neuter, wound repair, microchip ID, all at affordable prices. Open 7 days a week. Emergency pet services provided. Angel Pet Hospital is located in Edmonds, WA and welcomes your pets from all surrounding areas such as Mountlake Terrace, Lynnwood, Everett and Mukilteo. 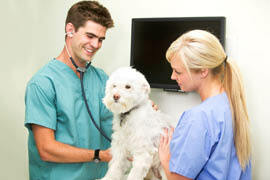 All of our veterinarians are experienced and licensed. We are members of the WSVMA and one of the AVMA.